The California chaparral and woodlands is a terrestrial ecoregion of lower northern, central, and southern California (United States) and northwestern Baja California (Mexico), located on the west coast of North America. It is an ecoregion of the Mediterranean forests, woodlands, and scrub Biome, and part of the Nearctic ecozone. California interior chaparral and woodlands: In central interior California surrounding the California Central Valley cover the foothills and the Transverse Ranges and Sierra Nevada. The California Central Valley grasslands ecoregion, as well as the coniferous Sierra Nevada forests, Northern California coastal forests, and Klamath-Siskiyou forests of northern California and southwestern Oregon, share many plant and animal affinities with the California chaparral and woodlands. Many botanists consider the California chaparral and woodlands, Sierra Nevada forests, Klamath-Siskiyou forests, and Northern California coastal forests as a single California Floristic Province, excluding the deserts of eastern California, which belong to other floristic provinces. Many Bioregionalists, including poet Gary Snyder, identify the central and northern Coast Ranges, Klamath-Siskiyou, the Central Valley, and Sierra Nevada as the Shasta Bioregion or the Alta California Bioregion. Southern coastal sage and chaparral in the Santa Monica Mountains, near Malibu. The ecoregion includes a great variety of plant communities, including grasslands, oak savannas and woodlands, chaparral, and coniferous forests, including southern stands of the tall coast redwood (Sequoia sempervirens). 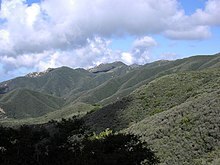 The flora of this ecoregion also includes tree species such as Gray or foothill pine (Pinus sabiniana), Scrub oak (Quercus dumosa), California buckeye (Aesculus californica), the rare Gowen cypress (Cupressus goveniana), the rare Monterey cypress (Cupressus macrocarpa), and a wealth of endemic plant species, including the extremely rare San Gabriel Mountain liveforever (Dudlea densiflora), Catalina mahogany (Cercocarpus traskiae), and the threatened most beautiful jewel-flower (Streptanthus albidus ssp. Peramoenus). Hesperoyucca whipplei, colloquially known as Chaparral Yucca, is commonplace throughout the lower elevations of the climate zone. Species include the California gnatcatcher (Polioptila californica), Costa's hummingbird (Calypte costae), coast horned lizard (Phrynosoma coronatum), and rosy boa (Lichanura trivirgata). Other animals found here are the Heermann kangaroo rat (Dipodomys heermanni), Santa Cruz kangaroo rat (Dipodomys venustus), and the endangered white-eared pocket mouse (Perognathus alticolus). Another notable insect resident of this ecoregion is the rain beetle (Pleocoma sp.) It spends up to several years living underground in a larval stage and emerges only during wet-season rains to mate. Chaparral, like most Mediterranean shrublands, is highly fire resilient and historically burned with high-severity, stand replacing events every 30 to 100 years. Historically, Native Americans burned chaparral to promote grasslands for textiles and food. Though adapted to infrequent fires, chaparral plant communities can be exterminated by frequent fires especially with climate change induced drought. Today, frequent accidental ignitions can convert chaparral from a native shrubland to nonnative annual grassland and drastically reduce species diversity, especially under global-change-type drought. The region has been heavily affected by grazing, logging, dams and water diversions, and intensive agriculture and urbanization, as well as competition by numerous introduced or exotic plant and animal species. Some unique plant communities, like southern California's Coastal Sage Scrub, have been nearly eradicated by agriculture and urbanization. As a result, the region now has many rare and endangered species, including the California condor (Gymnogyps californianus). ^ Keeley, JE; Davis, FW (2007). "Chaparral". In Barbour, MG; Keeler-Wolf, T; Schoenherr, AA. Terrestrial Vegetation of California (PDF). Los Angeles: University of California Press. pp. 339–366. ^ Vale, TR (2002). Fire, Native Peoples, and the Natural Landscape. Washington, DC: Island Press. pp. 269–286. ^ a b Syphard, AD; Radeloff, VC; Keeley, JE; Hawbaker, TJ; et al. (2007). "Human influence on California fire regimes" (PDF). Ecological Applications. 17 (5): 1388–1402. doi:10.1890/06-1128.1. PMID 17708216. ^ a b Pratt, RB; Jacobsen, AL; Ramirez, AR; Helms, AM; et al. (2014). "Mortality of resprouting chaparral shrubs after a fire and during a record drought: physiological mechanisms and demographic consequences" (PDF). Global Change Biology. 20 (3): 893–907. doi:10.1111/gcb.12477. PMID 24375846. Bakker, Elna (1971) An Island Called California. University of California Press; Berkeley. Dallman, Peter R. (1998). Plant Life in the World's Mediterranean Climates. California Native Plant Society–University of California Press; Berkeley. Ricketts, Taylor H; Eric Dinerstein; David M. Olson; Colby J. Loucks; et al. (1999). Terrestrial Ecoregions of North America: a Conservation Assessment. Island Press; Washington, DC. Schoenherr, Allan A. (1992). A Natural History of California. University of California Press; Berkeley. This page was last edited on 1 April 2019, at 02:16 (UTC).